Most of you, who are Spanish native speaker’s maybe know about Colectivo Bunka – the largest press about Asian music in Spain, Colombia and Latin America. Colectivo Bunka supports bands, which are influenced by J-Music in Argentina, Peru, Chile, Mexico, Brazil etc. Colectivo Bunka is established in 2006 and till now have released 2 compilation albums with Latin American music groups, radio show in Spanish, media TV project – Bunka TV etc. Bunka radio is weekly on air from Latin America countries. It is mixing the modern music with cultural tradition of Asia. In their podcast are available interviews with several bands and also reviews and chronicles made by their correspondents. Bunka Central Emission plays from 20:00h to 22:00h every Monday. Don’t forget this is on Columbia time zone. Colectivo Bunka also presents Japanese bands in Spanish speaking world. They present most live bands or bands, which are influenced by Japanese music mostly. 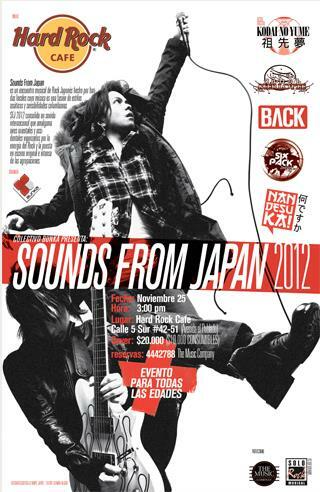 And so, they organize and produce 5 versions of “Sounds from Japan” project (from 2009 to 2012).